With Thanksgiving just around the corner, parents are gathering ingredients for a festive feast filled with culinary delicacies and decadence. The chill of fall is in the air, and the pace of life is naturally picking up with the holidays just around the corner. During this busy time, it’s important to remember the purpose of Thanksgiving Day and remind ourselves to cultivate thankful attitudes in our kids not only each November but year-round. Gratefulness can not only be taught but also caught in our homes. Here are some ideas to cultivate thankfulness in our kids—especially during the Thanksgiving holiday. Create a culture of gratefulness. Dinnertime offers great opportunity to influence the hearts and lives of all those at our table. Our children often learn more by what we do than what we say. 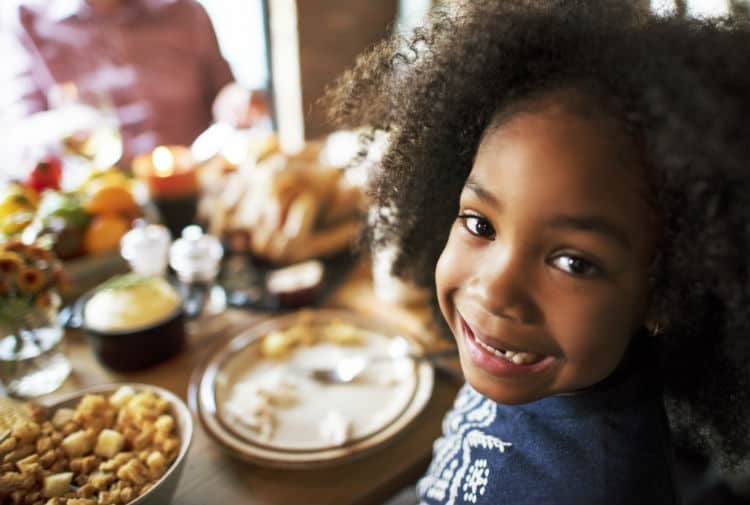 By giving thanks for our food and offering the opportunity to each person present to express one thing they are thankful for, we cultivate grateful hearts in our children. Design traditions of thankfulness. Each time a parent gives a present to someone in the family, the family member expresses sincere thankfulness immediately. Teaching children thankfulness prevents them from sliding down the slippery slope into negative attitudes, grumbling, and a sense of entitlement. Promote thankfulness by not taking the little things for granted. Spontaneous thanks are given to the individual who cooks delicious meals, drops children at music lessons, coaches their sports teams, and buys their clothes. Teaching children gratefulness in the little things sticks with them for life, so take advantage of every teachable moment. Never underestimate the importance of a thank you note. Children do what they see you do. When you receive a gift, write a thank you note to the recipient. Remember who is watching you. When a waitress takes good care of your family at a restaurant, express your sincere thanks, and tip well. Children will duplicate what you do as they grow. Be intentional about thanking people who no one else may thank. Have you ever considered giving a token of thanks to those who pick up garbage at your home? Also, offering a word of appreciation to the housekeeping staff while staying at a hotel is a great way to teach children to take the extra effort to express appreciation for others who do things for them. When it’s your children’s turn to thank someone. Keep thank you notes on hand for children to send to grandparents and others who give them gifts or do nice things for them. It may feel like pulling teeth the first time you require this, but if you’ll gently guide their efforts, they will grow in gratefulness as a result. Teaching children to be thankful by modeling thankfulness ourselves is perhaps the best way to cultivate a grateful attitude within them. Children notice the genuine appreciation we show others. When others are hospitable, thank them. Children notice our attitudes and grow up following our example. Include children in regular household responsibilities. When kids are required to pull their weight in the family by doing chores, they learn the value of hard work, and they become thankful for the work others do on their behalf. Include children in saving toward their desired purchases. When we include our kids in the purchasing of toys or items they desire, they appreciate the outcome more than if things were constantly given to them. They learn delayed gratification, the value of work, and the reward of saving. When they see how much it takes to obtain their desires, it causes them to appreciate what others buy for them, and they learn to be grateful for what they have. If we recognize as parents that childhood is like seedtime and the seeds we sow will reap a harvest for a lifetime, we’ll be intentional about what we sow into their lives. We’re to train up our children in the way they should go, and that implies we are to initiate and train them up intentionally. It takes purposeful focus to guide them in the way they should go and cultivating thankfulness equips them for life. Call Read Smart at (918) 559-7323 for a free reading evaluation with the top reading program in Tulsa.